I loved that I was not restricted on a certain number of items at breakfast, but could take as much of what ever I wanted. That is much appreciated! When would you like to stay at YHA Bristol? Get 5% off the total booking if at least one guest is under 26. A former waterfront grain house, YHA Bristol has been sympathetically restored to offer relaxed, well-appointed accommodation amongst city-centre surroundings, ideal for a cheap city break or weekend away. The hostel’s bustling bar and stylishly decorated reception area is a great place to meet up with friends and make plans for your stay. It complements the industrial feel to the building and embodies both the vibrancy and quirkiness of Bristol as a destination. Plus, the hostel is also close to a number of the city’s very best attractions and eateries. 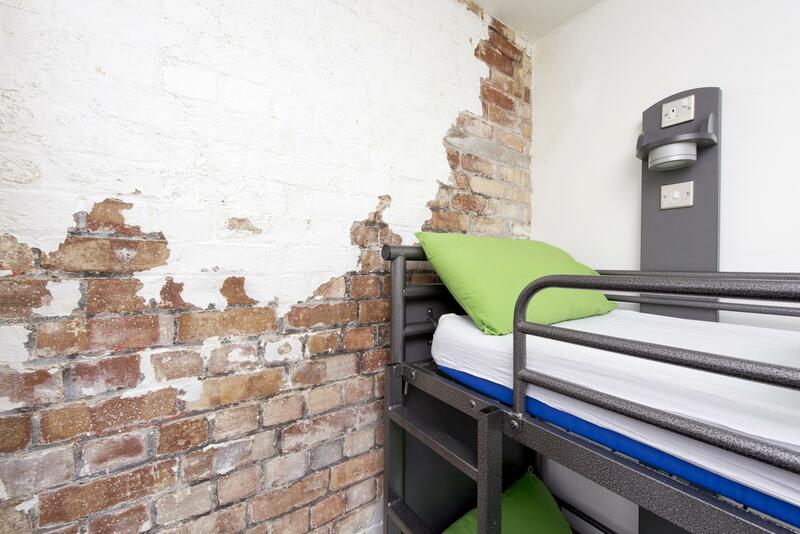 YHA Bristol has 133 beds in a selection of dorm rooms and private rooms, some of which are en-suite. We've even upgraded the beds to give you a more comfortable stay. A former waterfront grain house, this Youth Hostel has been sympathetically restored to offer relaxed cosmopolitan surroundings, ideal for a cheap city break or weekend away. The bustling bar and stylishly renovated reception area is a great place to meet up with friends and make plans for your day. It has recently had a facelift and beautifully complements the building, embodying the vibrancy of Bristol as a destination. There is also a library and games room for guests to enjoy. Chic new furniture can be seen throughout the social areas. Our well equipped self-catering kitchen has everything you need to prepare a delicious meal for yourself and your friends/family including two ovens and four fridges to store your food. The Grainhouse Café & Bar provides guests and the public with a contemporary, relaxed and cosy atmosphere in the heart of this vibrant city. Offering a broad selection of delicious food, alongside a range of freshly made hot drinks and a well-stocked bar. Open daily to guests and passers-by, let us welcome you to rest your legs and indulge your senses after the day’s sightseeing. Breakfast is the most important meal of the day and we want to make sure you get off to a great start so we provide a full hot and cold breakfast buffet. Cold meats, cheeses, fresh fruit and yogurt are on offer for the health conscious or light eaters and, for the hungrier amongst you, a full English breakfast. Breakfast is served from 7.30 – 9am and you can get up to 15% off breakfast as part of your online booking. Choose from our tasty daily specials or delve into our café-bar style menu experience, think scrumptious bar snacks, trendy English tapas, stone-baked pizzas and piled-high burgers. Don’t forget, kids under 10 eat free – get one kid’s meal free with every adult’s meal. Join our nightly Supper Club. Share stories and experiences with your fellow travellers while tucking into a delicious two course meal. This is the authentic hostel experience! Don't forget, you can now save up to 15% when you add meals to your online booking. With over 300 hands-on exhibits to explore, live shows and a planetarium, this is one of the most exciting interactive science centres in the country. Dive into a breathtaking 3D underwater world and be transported below the ocean's surface to watch some of the planet's fascinating creatures. From its tragedies to triumphs to the extraordinary lives of ordinary people, Bristol has incredible stories to tell and you'll find plenty of them here. M Shed is a museum all about Bristol. Learn the thrills and challenges of this exciting sport. Undercover Rock provides everything from indoor taster sessions to major rock climbing adventures. St Nicholas indoor market is one of the city's best kept secrets. As well as great places to eat, there are loads of independent retailers selling books, clothes, art and music. A guided tour of some of Bristol's world famous street art, painted by the infamous Banksy. The tour runs all year round so ask at the hostel reception for more details. The SS Great Britain is dubbed the ship that changed the world! Discover the world's first great luxury liner, right here in Bristol. A treat for nautical lovers of all ages. Stride out on foot to explore the vibrant city of Bristol. There's loads to see, and you can wander round the city at your leisure taking in the sights. Get out and about on your bike and enjoy the landscape. Whether it's town or countryside you want to explore, you can ride as far as your legs will allow you. This lovely area is great for water sports, so whatever mode of water transport takes your fancy, take the plunge and enjoy some fun on, or in, the water! Aerospace Bristol tells the amazing story of this region's world-class aerospace industry and gives you the chance to step aboard a British icon - Concorde. Towels and toiletries : Towels and toiletries are not provided but are available to hire or purchase from reception. Bedding is supplied. Parking: There is no car park at the hostel, but there are several pay and display car parks nearby. We recommend Wapping Wharf Car Park, Wapping Road, Bristol BS1 4RW and 40 The Grove, Bristol BS1 4RB, both of which are good value and a short walk from the hostel. Pets: Pets are not permitted at YHA Bristol. Assistance dogs are welcome. Wi-Fi: Free wi-fi is available in social spaces. Breakfast: Breakfast is served from 7.30am til 9am. YHA Bristol is within easy reach of all of the city’s educational centres such as the Science Museum. The hostel holds 133 people, has internet access, class room facilities and group catering. Visit the YHA School Trips website to book your school visit. At YHA Bristol we have three meeting rooms available for hire – The Conference Room, The Meeting Room and The Board Room. Available Equipment: Data projector/ Large flat screen TV, flipchart and pens, whiteboard. Parking: There is no parking at YHA Bristol, but plenty of PAYG car parks a short walking distance. Accessibility: Unfortunately the Mezzanine room is only accessible by stairs. However, the Conference room and Meeting room both have step-free access via the lift. The closest accessible bathroom is on the 1st floor and ground floor. For more information please see our access statement. Air conditioning: All rooms are air heated. The meeting room and board room have air conditioning. Volunteering with YHA is a fantastic way to have fun, learn new skills, boost your CV and travel to different places. We have a variety of different opportunities to choose from and volunteering roles to suit everyone. The tasks are varied and in return you will meet some great people, who both work and stay in our hostels, as well as enjoying your time off discovering the local area and attractions. You can find out more and apply to volunteer at this hostel on the volunteering website. The hostel is a former tea warehouse and is named after Mr and Mrs Hayman, tireless workers for the local YHA Group, though it is informally called the Grain House! The hostel had a stylish renovation to its social areas in 2015 and is a fab staple of the waterfront. Manager Richard recommends: Have a freshly cooked pizza and a drink in our relaxing Grain House bar or sit on the harbour side and watch the world go by - the perfect wind-down after visiting all the amazing attractions Bristol has to offer on your city break. Or combine a competitive spirit with a sense of fun, add a couple of pints of continental beer and you’ve the recipe for a fantastic evening at Kongs of King Street, a laid back bar full of retro arcade games, ping pong and more.